Clara's in the process of moving to a downstairs bedroom. Once upon a time it belonged to Giles, then to Felix. They have both officially Moved Out, and it doesn't make a great guest bedroom, but Clara wanted it. First she wanted to freshen it up. 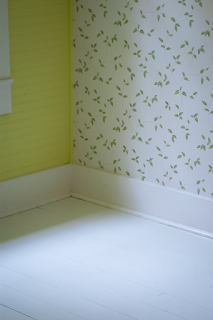 She ripped out the 1974 gold shag carpet from the closet, painted the closet interior a fresh white, then got her father to lay down a laminated floor (so easy, you just put them down like stickers. This is just the closet, mind you). She's painting all her furniture a fresh coat of white, out on various porches, and I've taken on painting the floor of the room. It had a scuff or two. Or forty. You can see it with one coat, and it gets another this weekend. Once all this is put back together, it'll be a lovely place. And, Daisy's got her heart's desire: Clara's upstairs room for her own. That sounds just lovely. Your house is getting re-done, little by little, and in such a nice way. 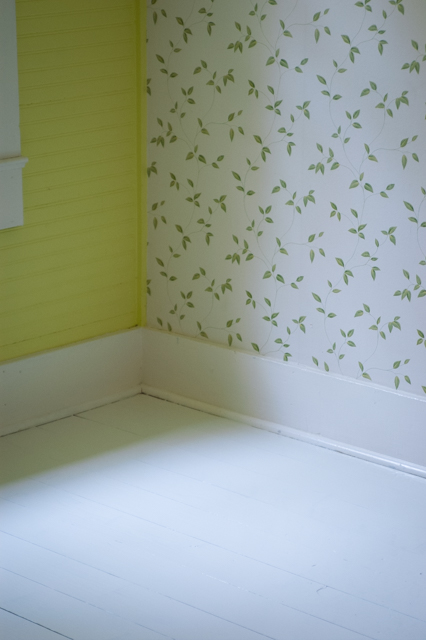 Very lovely, the wallpaper is so pretty too! pretty fresh greens and white! A change is indeed as good as a holiday. Daisy has gone from mango to blue to yellow. Good for her! I can't wait to see Clara's final results. Wasn't Daisy in that room for a short while too? What are Clara's plans- I thought she has just graduated from college? Yep, Clara graduated. She works for the law firm as an office assistant/paralegal--at least for now. She's toying with the idea of grad school next year.